You survived the frozen winter and struggled through a soggy spring. Now that June is here you can feel the approaching days of warm weather and shining sun. There’s just one last hurdle to clear: preparing your custom deck for the months to come. Professional builders will have expert knowledge of deck construction and understand what it takes to prepare a deck for summer enjoyment. 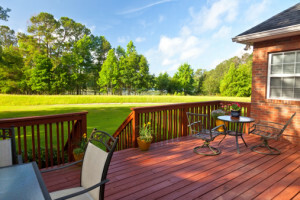 These deck contractors and builders have created this easy how-to guide to ensure that customers are informed and able to take the steps necessary to get their decks ready for the summer. Begin by clearing your custom deck as much as possible: take all of the planters, tables, chairs, light fixtures, and other items that normally decorate your deck and move them elsewhere for the time being. Next, sweep it over to brush away any dirt, leaves, twigs, and the like that have accumulated. A putty or butter knife can be used to get any debris that has accumulated in cracks or between boards. You don’t need to get the deck sparkling clean, but you should have it mostly clear for the next step. Once the deck has been cleared, conduct a thorough inspection. Boards need to be examined to see if they are loose or damaged and wooden decks will require noting of any splintered boards that need sanding. Keep track of screws in need of tightening or protruding nails that require replacement. Inspect your deck’s stairs for cracks and check the railing to make sure it’s still secure. These items will need to be taken care of before the next step can occur. Fortunately, most can be handled on your own, though if you’re unsure about replacing a board yourself, there’s always the option of hiring a deck contractor for a quick repair job. The ultimate goal of preparing your custom deck for the summer is to apply a coat of stain to give it proper weather protection. The penultimate step for doing that is to clean and wash the deck. Giving your deck a proper scrubbing means you need a solid deck cleaner, push brush, or power washer. A quick word of caution: power washers can damage wood if held for too long in one place or too close, so be conservative in your use. If your deck is wood, you’ll need to apply a sealant every year to give it adequate protection and stain. This final step can be done by hand or with the assistance of a deck contractor if you’re not confident in your own skills or just desire a professional touch. 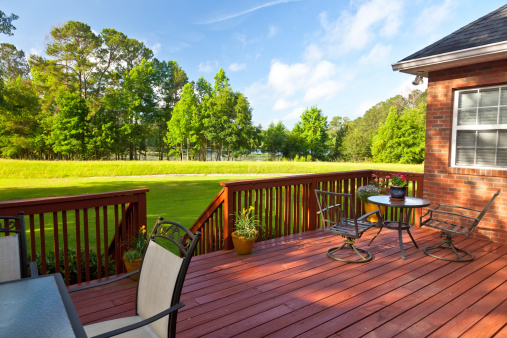 If you plan to do it yourself, staining a deck is a lot like painting a room. You use a roller to apply a thin, even coat on the surface of your deck while employing a brush to get between boards or in any places the roller has trouble reaching. Additional coats may be needed depending on the recommendations of your specific stain or sealant. If there is any furniture, barbeques, or similar objects still on the deck at the start of this stage, you’ll want to cover them with a spare cloth or tarp to protect them. Before beginning the staining and sealing step, make sure you know what the forecast is going to be. You’ll need around two days without rain (check manufacturer recommendations of your stain for specifics) to properly apply the stain. Give the deck two days to dry before going out or moving your furniture back on. If along the way you find your deck may be beyond repair or could use some additional features, like a raised platform or custom-built carpentry, it may be time to call a professional deck contract. Call the Deck Building Experts at Total Fence Inc.
Total Fence Inc. is one of the top fence and deck builders in the Greater Toronto Area. Our expert deck contractors know the best ways to get a custom deck ready for summer enjoyment. Contact Total Fence Inc. at 416-239-5362 to speak with a consultant and learn the best way to prepare your deck for the summer months.